It has been a little while since my last post, but I have been working a lot lately (which, for me, is a good thing). 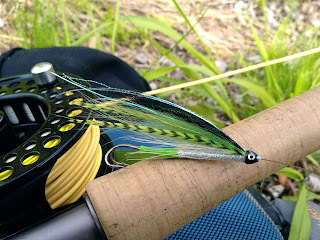 I have been tying, but I've just been lazy about photographing flies and posting. Excellent trout fishing during an unusually early New England spring has been quite a "distraction" as well! This fly is my interpretation of a pattern shown in Henrik Mortensen's fifth DVD, "The Scandinavian Spey Cast II." Mortensen shows a handful of these flies, but does not go into detail about the dressing. Though I do not know the exact dressing, I'm confident that my interpretation comes close enough to the original and it should work fine for early/late season salmon. Actually, I've caught quite a few trout on the orange one so far this season, so I might have to tie extras for my streamer box. As a side note, this was a little bit of a crude, DIY, cost-saving project. The aluminum tubes are from a local hobby shop/art supply store, though they are lined with HMH liner tube. I believe I paid under $2 for 3' of aluminum tubing, which is substantially less than what anyone in "the industry" charges for a pack of aluminum tubes. They can be easily cut by rolling a straight edge razor perpendicular to the tube, then breaking it in two. The ends are filed smooth and then the tube can be lined. The grizzly hackle is from a Whiting Bugger Pack. I don't need a ton of it dyed in different colors, so I used Aaron Ostoj's Kool-Aid dying instructions and got pretty good results. Instructions can be found on Ronn Lucas's website (under "Articles, Documents, Ephemera"). It's really easy, inexpensive and the colors can be quite vibrant. I have even tried mixing colors with some great results. Happy tying and fishing...I'm very excited that salmon season is almost here! As always, feel free to contact me with any questions. ***UPDATE (07.19.14): It looks like there is a bit of intrigue pertaining to the origins of this deadly fly. A friend filled me in on the backstory last night. See the article linked below for details. Here is a trailer from Mortensen's "The Scandinavian Speycast II"